Atty. Alvin Talag Claridades belonged to the first batch of law students, originally made up of 23 “plucky pioneers” who enlisted when the PUP College of Law opened in 2001. He was a founding officer of the PUP Law Students Society, Inc. (PULSO), the forerunner of the current PUP Law Student Council. He was also the first editor-in-chief of “Lex Novus”, the official student organ of the college which first saw print in 2003. Likewise, he was a contributor of the “Law Review” of the college the maiden issue of which came off the press in May 2005. Also a registered civil engineer by profession, he had his first job as an engineering aide at the Department of Public Works and Highways – Third Metro Manila Engineering District (DPWH-TMMED) based in Malabon, Metro Manila from 1988 to 1992. In between his working time and private errands, he tried to find time to write articles, essays and. at times, poems. He edited community newspapers like “Pahayagang Obando”, “Tinig”, “Parish Newsette”, Balitang CROWD” and “Pascualian”, contributed to “Pilipino Reporter” magazine and had some of his opinion writings published in national dailies like “Malaya”, “We Forum”, “Inquirer”, “Philippine Star”, “Manila Times”, “Manila Standard”, “Balita” and “Today”. Atty. Claridades earned his undergraduate degree at the Technological Institute of the Philippines (TIP) in Manila in 1986 as a scholar of the Secretary Guillermo De Vega Memorial Scholarship grant. A ghostwriter for the local chapter of the League of Filipino Students (LFS), he exposed the repressive anti-student policies of the martial law regime. He was also an active student leader and founded the Leaders’ Alliance for a Genuine, Democratic and Autonomous Student Council (LAGDA-SC). When not donning his militant hat then, he was actively participating in extra-curricular campus activities. He was a bemedalled essayist, extemporaneous and impromptu speaker, quiz bee winner and a math wizard as well. In 1999, he pursued graduate studies at the Polytechnic University of the Philippines (PUP) as a scholar of the Civil Service Commission (CSC) and completed his academic requirements leading to the degree of Master in Public Administration (MPA) in just three (3) semesters. However, while in the thick of preparations for his masteral thesis, the PUP College of Law was born in June 2001 and opened its doors to would-be law students. Not wanting to pass up the chance of finally fulfilling his cherished dream of becoming a member of the august profession, he tried his luck. After spending hundreds of hours on the recitation floor and more hours spent poring over tons of reading materials and digesting oodles of case laws, Atty. Claridades finally graduated with a degree of Bachelor of Laws on May 5, 2006. 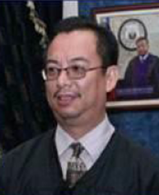 He took the bar examinations in September 2006 and passed the same in April 2007, becoming one of the first eight (8) lawyers produced by the then fledgling PUP College of Law. At present, Atty. Claridades is a Director IV at the Housing and Urban Development Coordinating Council (HUDCC), an attached agency of the President of the Philippines currently chaired by Vice President Jejomar Binay. He has also been a member of the faculty of the PUP College of Law since 2010, teaching various subjects such as Statutory Construction, Legal Writing, Legal Forms, Environmental Law, Agrarian Reform Law and Civil Procedure.